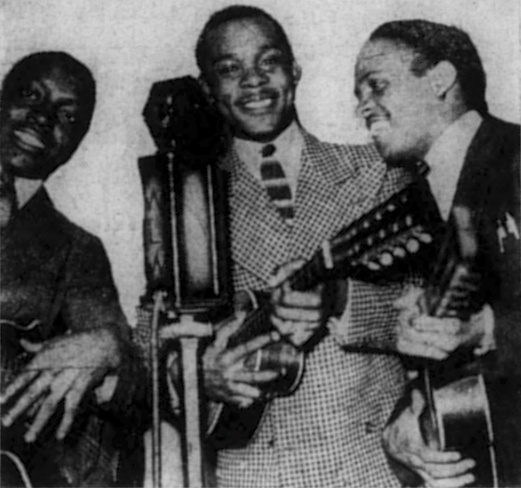 The Three SpadesPictured above are William Jennings, Jerry Daniels, and Al Jennings, known in the 'profesh' as The Three Spades, who returned recently from New York, where thay made a name for themselves on Broadway. The trio of mirth provokers with a guitar and two tippies, wowed 'em at the Kit Kat, Leon and Eddies, Onyx Club, and the Harlem Uproar House. Before going to New York, the boys were a sensation over station WLW in Cincinnati from March until September. They will leave shortly for an extended engagement in New York, and possibly a tour of Europe.